What are the Main Running-Related Musculoskeletal Injuries? Musculoskeletal injuries occur frequently in runners and despite many studies about running injuries conducted over the past decades it is not clear in the literature what are the main running-related musculoskeletal injuries (RRMIs). The aim of this study is to systematically review studies on the incidence and prevalence of the main specific RRMIs. An electronic database search was conducted using EMBASE (1947 to October 2011), MEDLINE (1966 to October 2011), SPORTDiscus™ (1975 to October 2011), the Latin American and Caribbean Center on Health Sciences Information (LILACS) [1982 to October 2011] and the Scientific Electronic Library Online (SciELO) [1998 to October 2011] with no limits of date or language of publication. Articles that described the incidence or prevalence rates of RRMIs were considered eligible. Studies that reported only the type of injury, anatomical region or incomplete data that precluded interpretation of the incidence or prevalence rates of RRMIs were excluded. We extracted data regarding bibliometric characteristics, study design, description of the population of runners, RRMI definition, how the data of RRMIs were collected and the name of each RRMI with their rates of incidence or prevalence. Separate analysis for ultra-marathoners was performed. Among 2924 potentially eligible titles, eight studies (pooled n = 3500 runners) were considered eligible for the review. In general, the articles had moderate risk of bias and only one fulfilled less than half of the quality criteria established. A total of 28 RRMIs were found and the main general RRMIs were medial tibial stress syndrome (incidence ranging from 13.6% to 20.0%; prevalence of 9.5%), Achilles tendinopathy (incidence ranging from 9.1% to 10.9%; prevalence ranging from 6.2% to 9.5%) and plantar fasciitis (incidence ranging from 4.5% to 10.0%; prevalence ranging from 5.2% to 17.5%). The main ultra-marathon RRMIs were Achilles tendinopathy (prevalence ranging from 2.0% to 18.5%) and patellofemoral syndrome (prevalence ranging from 7.4% to 15.6%). This systematic review provides evidence that medial tibia stress syndrome, Achilles tendinopathy and plantar fasciitis were the main general RRMIs, while Achilles tendinopathy and patellofemoral syndrome were the most common RRMIs for runners who participated in ultra-marathon races. Supplementary material is available for this article at 10.1007/BF03262301 and is accessible for authorized users. Running is one of the most popular physical activities enjoyed by people around the world and the number of runners has grown substantially over the past decades. People seeking a healthier lifestyle through weight control and improved exercise capacity frequently choose running, as this has been considered to be of low cost and can be easily implemented. More importantly, running has many beneficial effects including a reduction of risk factors for cardiovascular disease. Despite these health benefits, running injuries are common, with incidence rates ranging between 18.2% and 92.4%,[4, 5, 6] or 6.8–59 injuries per 1000 hours of exposure to running. [7, 8, 9, 10, 11, 12] This large variation in incidence rates of running injury may be explained by the difference in the subjects’ characteristics, as well as the definitions of running-related musculoskeletal injuries (RRMIs), which differ between studies. Studies have been conducted to identify what are the most common injuries among runners. [2,6,8,12, 13, 14, 15, 16, 17, 18, 19] However, because of a large heterogeneity in the studies performed (e.g. RRMI definition, type of runners, injury classification and/or diagnosis), the literature does not provide a clear direction on the most incidental and/or prevalent RRMIs. In the prevention and rehabilitation of RRMIs, the identification of the main injuries is important as this can direct physicians, coaches, healthcare professionals and researchers to channel their resources on how to develop specific prevention and intervention strategies to decrease both the incidence and severity of these injuries. To our knowledge, there is no systematic review that summarizes the incidence and prevalence estimates of each RRMI. Therefore, the aim of this study is to systematically review the literature on the incidence and prevalence of RRMIs. An electronic database search was conducted on EMBASE (1947 to October 2011), MEDLINE (1966 to October 2011), SPORTDiscus™ (1975 to October 2011), Latin American and Caribbean Center on Health Sciences Information (LILACS) [1982 to October 2011] and Scientific Electronic Library Online (SCIELO) [1998 to October 2011] databases, with no limits of language or date of publication. The date of the last search was October 2011 and the search strategy, terms and operands used are presented in table I. 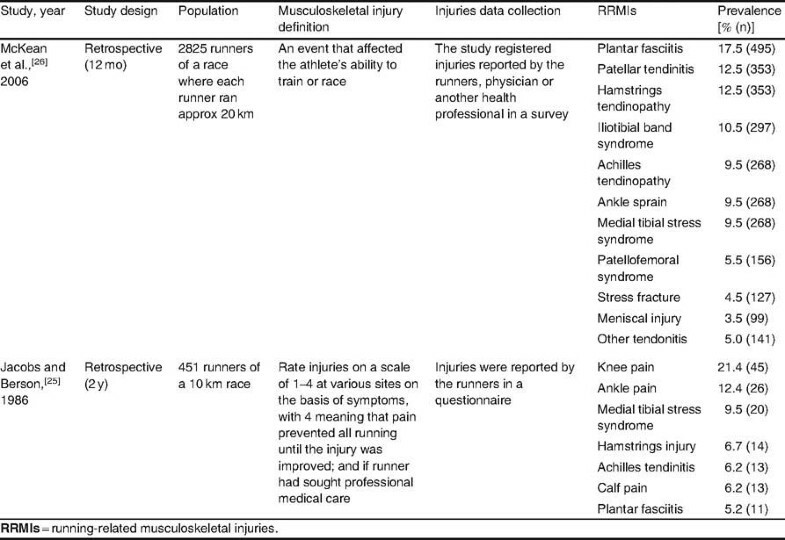 We included articles related to RRMIs that clearly described or diagnosed running-related injuries with their rates or frequency distribution (incidence or prevalence) of each RRMI. The inclusion criteria were prospective cohort studies and non-intervention groups from clinical trials related to the prevention of running-related injuries that included only runners without injury in the selection process of the study (for incidence estimates); and prospective, cross-sectional and retrospective studies that included injured and uninjured runners in the selection process of the study (for prevalence estimates). We excluded articles that (i) included only injured runners as their sample; (ii) described only the injury type (e.g. tendinopathy) or anatomical region (e.g. knee injury) but without a clear definition of the injury (e.g. Achilles tendinopathy); (iii) do not provide quantitative data regarding the injuries rate or frequency distribution (incidence or prevalence) of each RRMI or incomplete data (i.e. 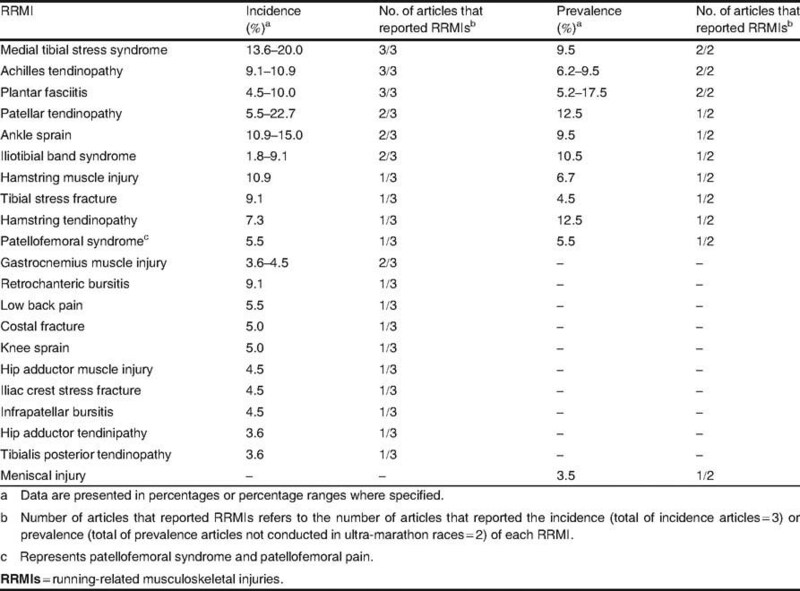 we excluded articles that did not present incidence and/or prevalence estimates of all RRMIs) that precluded interpretation of what would be the most frequent RRMIs in runners; and (iv) described the running-related injuries together with other sports injuries in which the RRMIs could not be distinguished. The screening of eligible studies was performed in three steps: (i) screening the titles; (ii) screening the abstracts; and (iii) screening the full texts. Each step was performed by two independent reviewers (LCHJ and ACAC) and, in case of disagreement between the reviewers, a final arbitration was performed by a third independent reviewer (ADL). 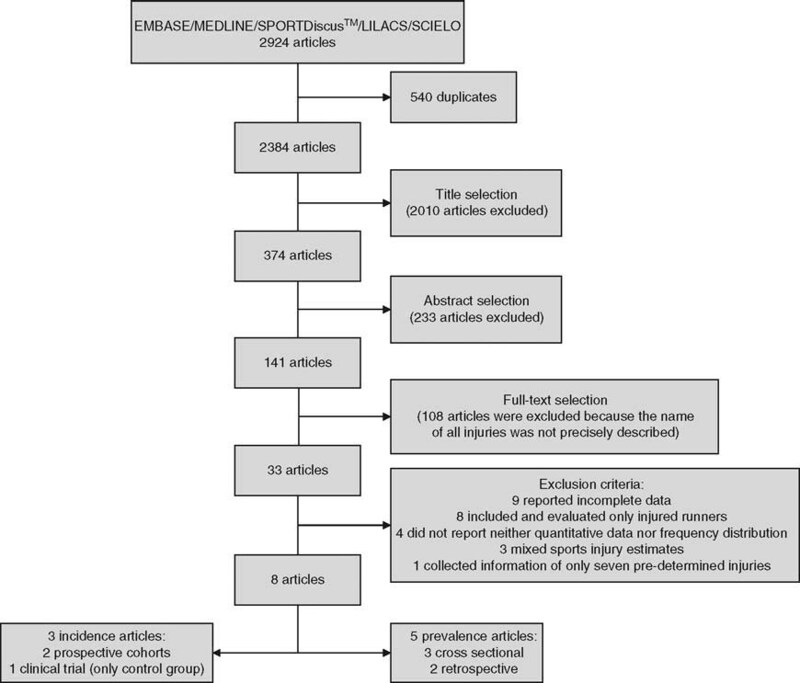 Data from each article were extracted by one reviewer who extracted the following information: first author, year of publication, study design, description of the population of runners (e.g. marathon or half-marathon runners), definition of RRMI, how the data of RRMIs were collected and the incidence or prevalence rates of the RRMIs. Information regarding incidence was extracted from prospective studies that evaluated uninjured runners who were followed over the study time period (new injuries analysis). Information regarding prevalence was extracted from retrospective and/or cross-sectional studies that did not include injured runners only in the subject population. As the articles included in this review consisted of prospective, retrospective, cross-sectional and clinical trials, we were unable to find any validated published tool that could be applied to evaluate the risk of bias with such diversified research designs. Therefore, the authors of this review developed the criteria for assessing risk of bias of the articles based on the criteria used in three previous studies. [5,21,22] Among them, one aimed to review the overall incidence of running injuries, another study proposed a tool for assessing the risk of bias of prevalence studies on low back pain, and the last study suggested a methodological guide for conducting studies aimed to evaluate the rate or frequency distribution of overuse sports injuries. 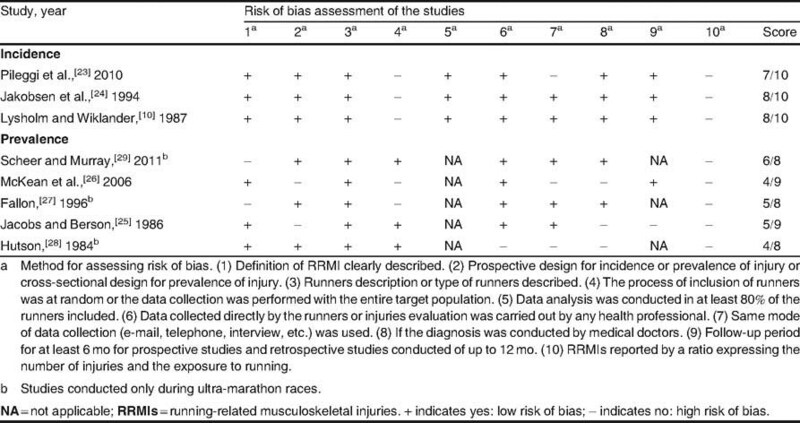 The criteria for assessing the risk of bias were (1) definition of RRMIs described in each article (yes/no); (2) studies with prospective designs that presented incidence data, or studies with prospective and cross-sectional designs that presented prevalence data (yes/no); (3) description of the population of runners or the type of the runners (e.g. marathon runners or half-marathon runners) that participated in the study (yes/no); (4) whether the process of inclusion of runners in the study was at random (i.e. not by convenience) or the data collection was performed with the entire target population (yes/no); (5) data analysis was performed with at least 80% of the runners included in the study (this criterion was applied only to studies with prospective design and assessed as ‘yes’ or ‘no’); (6) whether the data regarding the injuries were self-reported by the runners of the study or by a healthcare professional (yes/no); (7) whether the same mode of data collection (e-mail, telephone, interview, etc.) was used (yes/no); (8) whether the diagnosis was conducted by medical doctors (yes/no); (9) follow-up period of at least 6 months for prospective studies and retrospective data collection of up to 12 months for the retrospective studies (this criterion did not apply to cross-sectional studies and was assessed by ‘yes’ or ‘no’); and (10) incidence or prevalence rates of each RRMI expressed by a ratio that represents both the number of injuries as well as the exposure to running (e.g. RRMI/1000 hours of running exposure, and this criterion was assessed by ‘yes’ or ‘no’). The detailed description of each criterion and how the assessment of risk of bias was performed are presented in appendix 1 (see the Supplemental Digital Content, http://links.adisonline.com/SMZ/A11). Due to the heterogeneity of study designs, we did not pool the data for analysis. The analysis was conducted descriptively and the data were presented as frequency distributions of incidence or prevalence of each RRMI and were expressed as percentages. 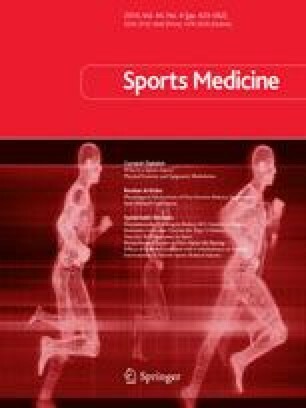 We decided to separately analyse the articles related to ultra-marathon races because these studies were only conducted during races that lasted from 5 to 8 days, and we believe that the injury data have different characteristics to those studies that captured the RRMIs with a defined period of time. We used two criteria to rank the most frequent RRMIs observed in this review (i) the number of articles that reported each RRMI, because it means that the injury was frequently found among the populations of the different running injury studies; and (ii) the highest incidence estimates for each general RRMI and the highest prevalence estimates for each ultra-marathon RRMI found among studies of this review. A total of 2924 articles were retrieved from the five databases. Among them, 540 were duplicated. After screening of the title, abstracts and full texts, if appropriate, only eight studies met the criteria for inclusion. Figure 1 shows the inclusion process for this review. Eight studies with 3500 runners were included in this analysis. Two were prospective cohort studies,[10,23] one was a clinical trial, two were retrospective cohorts[25,26] and three were cross-sectional studies. 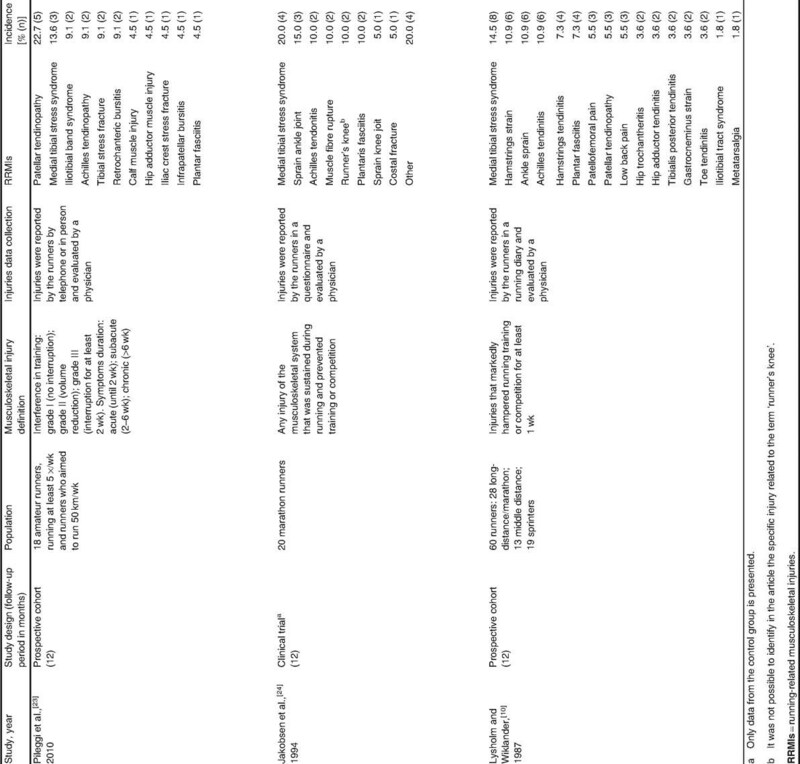 [27, 28, 29] Five of them evaluated the incidence[10,23,24] (table II) or prevalence[25,26] (table III) of the general RRMIs and three studies[27, 28, 29] captured the RRMIs during ultra-marathon races (table IV). The control group of the clinical trial was included in this systematic review because the participants of this group did not receive any intervention, and the inclusion criteria of the runners from this specific trial were not restrictive and were very similar to the other observational studies that were included. In assessing the risk of bias of these eight articles, of a total possible score of 10, the range of the overall score was 4–8. Table V details the score and assessment criterion on the risk of bias for these eight studies. Flowchart of the inclusion process of the articles in the systematic review. LILACS = Latin American and Caribbean Center on Health Sciences Information; SCIELO = Scientific Electronic Library Online. A total of 28 different RRMIs were reported in these eight studies. For the estimation of the incident rate of the RRMIs, the capturing period for the three studies was 12 months. For the prevalence, the retrospective periods were 12 and 24 months, respectively. The studies that captured the RRMIs during ultra-marathon races varied the race days from 5 to 6 or 5 to 8 days. The most frequent reported RRMIs differ between non-ultra-marathon runners and ultra-marathoners. Table VI shows the 21 general RRMIs. 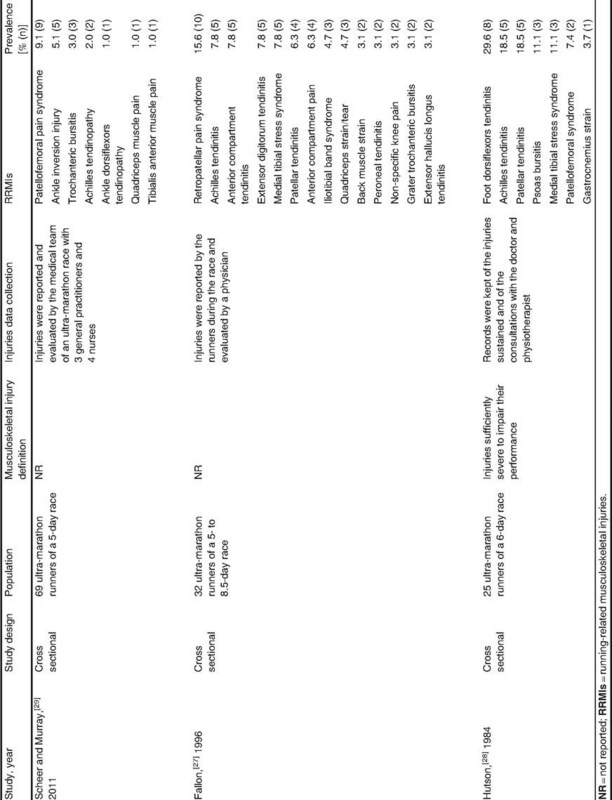 Table VII presents the 15 RRMIs reported during ultra-marathon races. The highest incident rate of RRMIs was patellar tendinopathy (22.7%). The most prevalent general RRMI was plantar fasciitis (17.5%) and the most prevalent RRMI during ultra-marathon races was ankle dorsiflexors tendinopathy (29.6%). The most frequently general RRMIs reported were medial tibial stress syndrome (incidence rate ranging from 13.6% to 20.0%; prevalence rate of 9.5%), Achilles tendinopathy (incidence rate ranging from 9.1% to 10.9%; prevalence rate ranging from 6.2% to 9.5%), and plantar fasciitis (incidence rate ranging from 4.5% to 10.0%; prevalence rate ranging from 5.2% to 17.5%). For RRMIs sustained during ultra-marathon races, the most frequently reported were Achilles tendinopathy (prevalence rate ranging from 2.0% to 18.5%) and patellofemoral syndrome (prevalence rate ranging from 7.4% to 15.6%). This is the first systematic review on the incidence and prevalence rates of RRMIs reported during distance running training or races. The eight articles included in this review differ in the study designs (prospective cohorts, one clinical trial, retrospective and cross-sectional studies), injury definitions and type of runners studied. A total of 28 RRMIs were reported, and the most frequently general RRMIs reported were medial tibial stress syndrome, Achilles tendinopathy and plantar fasciitis; and the main ultra-marathon injuries were Achilles tendinopathy and patellofemoral syndrome. In general, these studies presented a moderate risk of bias. The excessive loading during physical activity has been considered to be the main stimulus for the development of the tendinopathies. Repetitive stimuli load the tendon beyond its physiological tolerance leading it to degeneration. This excessive loading generated in the gastrocnemius and soleus muscles during running may predispose to the development of Achilles tendinopathy in runners. A retrospective study showed that running on sand surfaces and running races from 1500 m to 5 km increased the risk of Achilles tendinopathy. It might be because running on sand surface demands excessive push off, and runners normally prefer forefoot running for shorter races as this will decrease the landing time and increase the running velocity. Nonetheless, high quality, prospective cohort studies are needed to confirm these findings. Plantar fasciitis is considered by healthcare professionals to be one of the most common injuries of the foot, and it is characterized by a degenerative process of the plantar fascia that causes pain on the medial calcaneus tubercle during weight bearing. The failure of the fascia on supporting the loads applied to the body is commonly described as the mechanism of plantar fasciitis. Indeed, plantar fasciitis was the most prevalent RRMI among master runners. During the heel strike phase of running, the heel is the first contact point that has to absorb the impact of up to three times the total body weight. The ability to absorb and transmit this impact depends on the resilience of the plantar fascia, the plantar fat pad and the intrinsic muscles of the foot. With ageing or prolonged repetitive overuse, the absorbability of the plantar fascia and fat pad might decrease, and this might explain why master runners are more susceptible to have plantar fasciitis compared with other types of RRMIs. A prospective study also observed that more experienced runners were more prone to sustain foot injuries; however, this conclusion was classified as limited evidence in a previously published systematic review aimed to identify determinants of lower extremity running-related injuries. Studies have reported that patellofemoral syndrome is the most common RRMI among runners;[2,9,27,29] although our review revealed a different picture. 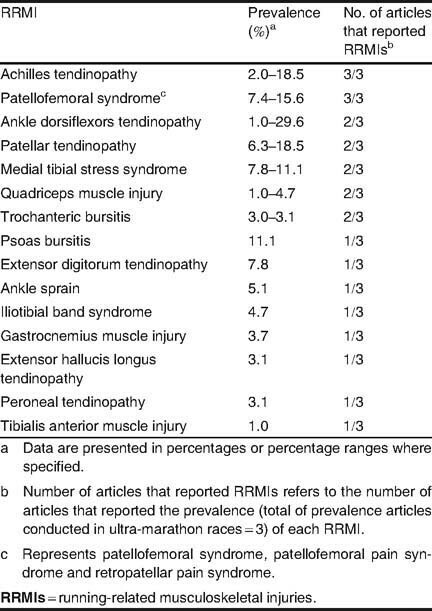 Patellofemoral syndrome did not present as the highest incidence or prevalence rates of general RRMI, and only two articles reported this injury. [10,26] We take note that one study used the term ‘runner’s knee’ to describe injuries around the knee region. However, ‘runner’s knee’ has been used by some authors to refer to patellofemoral syndrome[14,49,50] or iliotibial band syndrome. [51,52] Thus, we are not sure whether the authors referred to patellofemoral syndrome or iliotibial band syndrome in their study. We also suggest the term ‘runner’s knee’ should be avoided to describe the injury around the knee area until there is consensus on the exact pathology that we refer to. Based on the results of this review, the most common RRMI around the knee region is the patellar tendinopathy, which the sports medicine community generally agree is the ‘jumper’s knee’. Patellofemoral syndrome was common during ultra-marathon races[27, 28, 29] and it was the third most prevalent RRMI among the ultra-marathoners. The most frequently cited aetiology for the patellofemoral syndrome is the abnormal patellar tracking plus high compressive loads generated by the quadriceps femoris muscle contraction that lead to an increased stress on the joint. [54,55] The repetitive contractions of the quadriceps femoris during running may contribute to the high compressive loads in the patellofemoral joint favouring the development of patellofemoral syndrome. A prospective study that enrolled marathon runners concluded that participating in a marathon race for the first time, use of medication and running few kilometres per week were considered to be risk factors for the development of patellofemoral syndrome. Another prospective study showed that an increase of distance (kilometres) and the number of hours of training per week were considered to be protective factors against knee injuries in marathon runners. This was classified as strong evidence in a systematic review about this topic. Ankle dorsiflexors tendinopathy is common among ultra-marathon runners during a race. [28,29] The condition is not common among non-ultra-marathon runners and may indicate that this RRMI may be specific to ultra-marathon runners only. This tendinopathy has been quoted as an ‘ultra-marathoner’s ankle’ in one ultra-marathon study. Studies that aimed to register or evaluate RRMIs should describe how the diagnosis was made. The RRMI should best be diagnosed properly by medical professionals to minimize the risk of bias or misinterpretation of the diagnosis. All studies described the injury collection procedure and only two studies did not have a diagnosis made by medical doctors/professionals. [25,26] Four studies used a running diary or a questionnaire to register RRMIs by the runners themselves. [10,24, 25, 26] This self-reported information about an RRMI may only represent what the runners think about their injuries and the injuries themselves might be either under- or overestimated. Running injuries are primarily overuse injuries that occur due to the overloading of the musculoskeletal structures[15,30] caused by repetitive microtrauma over a long period of time. Thus, a long follow-up period is necessary to capture all the possible RRMIs and the response relationships with training. Three incidence rate studies (two prospective[10,23] and one clinical trial ) were conducted for at least 6 months and fulfilled this criterion. Retrospective studies are more prone to recall bias. [56,61,62] We consider a 12-month period to be acceptable, and a study has indicated that the recall bias within this period is around 12%. In order to compare the incidence or prevalence rates of RRMIs among different studies, it is necessary to express these injury rates in a comparable or common unit. Some studies with runners as the subjects reported RRMI rates by using the number of injuries per 1000 hours of exposure to running[7, 8, 9, 10, 11, 12] and this is more appropriate because the amount of exposure to the load (running) may influence the development of musculoskeletal injuries. Among the eight articles, only two of them stated the overall incidence ratio of RRMIs per 1000 hours of exposure to running[10,24] and no study stated the incidence or prevalence ratio of each RRMI. We suggest that future studies should standardize the expression of RRMI data by the ratio of the number of injuries per hour of exposure to running. This would enable comparison or pooling of data for meta-analysis. In addition, future studies should be conducted to determine a consensus about the definition of RRMIs, as well as aim to identify the main RRMIs in different types of runners (e.g. ultra-marathoners, marathoners, elite, recreational, race runners, etc.). Electronic searches were conducted in the main databases related to the sports injuries field. However, it is possible that eligible articles have been published in journals that are not indexed in any of the searched databases. The most frequent general RRMIs reported by studies were medial tibial stress syndrome, Achilles tendinopathy and plantar fasciitis. For runners who participated in ultra-marathon races that ranged from 5 to 8.5 days, Achilles tendinopathy and patellofemoral syndrome were the two most common RRMIs. These lower limb injuries are predominately located at the foot, ankle, lower leg or the knee. This study did not receive any funding. The authors have no conflicts of interest to declare that are directly related to the content of this study. The authors would like to thank Aline Carla Araújo de Carvalho for her contribution in the screening of eligible studies to be included in this systematic review. Supplementary material, approximately 94 KB.